Have a need for speed? 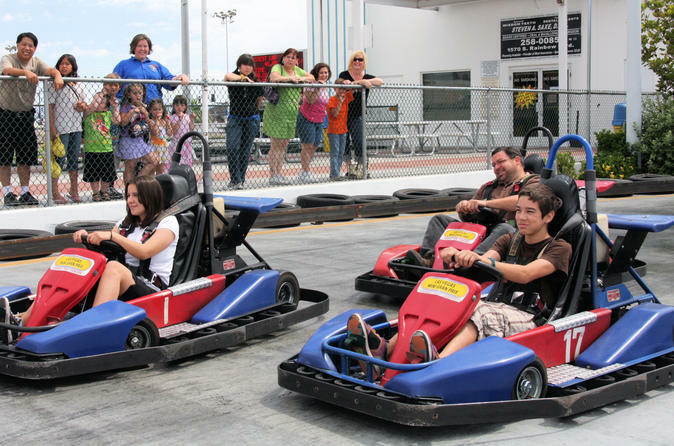 At Las Vegas Mini Gran Prix you can test this out on the Go Kart Road Course and Sprint Kart Speedway. Little ones can test out the Kiddie karts, Dragon Roller Coaster, Tornado Twister, Dive Bomber and Super Fun Slide. Upgrade to the Mega Ride Plus wristband to include Adult Gran Prix for the fast go-karting experience available. Adult Gran Prix (included in the Plus option): These are the newest and fastest Go Karts, running on the largest track in Las Vegas. Don't be fooled by others, if you want to race wheel to wheel against your friends to see who has the fastest time, this is it! (Must be 16 or older with a valid driver’s license. Closed toed shoes with no heels required. Bring your own helmet or use one provided.